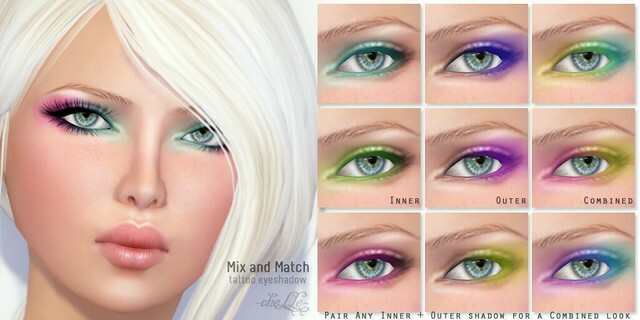 ✿ cheLLe ✿ Mix and Match includes six Inner and six Outer eyeshadows on the tattoo layer. Pair any Inner + Outer Shadow for a Combined look. The Combined look will have a slightly different gradient effect, depending on which layer you wear first (Inner first, then Outer on top or vice versa). We’ve also included a bonus Black Cat Eyeliner to wear over the shadows! i got these earlier today and love them. it’s an awesome idea to mix and match eye shadow colors! Got them right away. Indeed a great idea!